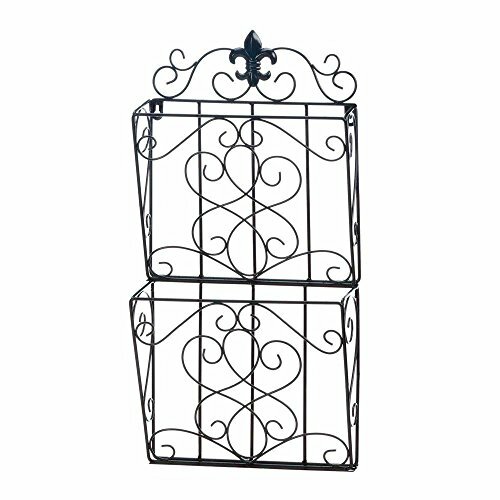 Accent Plus Mail Wall Rack, Fleur-de-lis Dual Decorative File Folder Wall Mount Magazine Rack by Accent Plus at Home Decor Outlet Store. MPN: AA-3296-5916. Hurry! Limited time offer. Offer valid only while supplies last. It\'s a great addition to your entry way, bathroom, office, and beyond. Keep your magazines, your mail, important papers, and more tidy with this lovely iron rack. Weight: 3 pounds, dimensions: 11.5" x 4" x 23.2".